Overly Animated has great news: on April 16 not only will the DVD for season 2 come out, but it will be on Blu-ray as well! Four days before then though, on April 12, volume 2 of the soundtrack will arrive! Curiously enough the announcement for the season set only mentions 22 episodes being included in the season set, so we’ll have to keep an eye out for a list of included episodes being released at some point down the line. 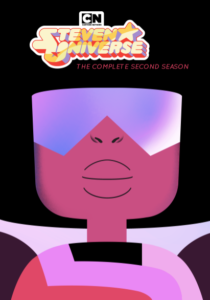 As an added bonus, a keychain of Cotton Candy Garnet’s head will be included with each season set (at least with every DVD—no idea if Blu-rays will get it as well). Great news! I’ve been waiting for the season 2 announcement since the first was released. I noticed that the season 1 set has two extra episodes after “Jailbreak,” namely “Full Disclosure” and “Joy Ride,” so that may be part of the explanation as to why there will be fewer episodes in this set.